ASTM A213 TP 347 SS Seamless Tubes Suppliers, Stainless Steel 347H Tubing Manufaturer, Stainless Steel 347 Cold Drawn Tubes Stockholder, SS 347H Tubing Exporter in india. MBM Tubes is one of the well-known manufacturer, stockist, exporter, stock holder and supplier of a qualitative range of Stainless Steel 347 Seamless Tubing that are designed as per international and national standard quality of raw materials. We supply common grades such as Stainless Steel Cold Drawn 347 Tubes in standard tube sizes and wall thicknesses. SS 347 Cold Drawn Tubes has some special properties such as it has an excellent resistance to high-temperature corrosion, also has an excellent processing characteristics, and others. We also supply general grades such as Stainless Steel Cold Drawn 347H Tubes in standard tube sizes and wall thicknesses. 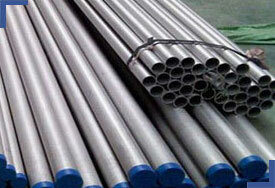 Our range of SS 347 Tubing is extremely economical, and thus making our products highly valuable among our clients. Most sizes of SS 347 Tubes tube can be cut to exact sizes. Non standard sizes of SS 347 Seamless Tubing can be made to order. SS 347H Tubes are available in diverse sizes, grades and shapes, and are quality passed and tested as per international standards. MBM Tubes as well fabricate and design these SS 347H Tubing in different specifications and designs as per requirements of our customers. Stainless Steel DIN 1.4550 / 1.4961 Seamless Tubes Stockist, SS UNS S34700 / S34709 Seamless Tubing, SS 347 Cold Drawn Tubes, SS 347H Seamless Tubes, SS 347 Seamless Tubing in India.